Massive cuts are to go ahead at the new £189m Library of Birmingham, but for now at least the library's Photography Collections' team is to be saved. 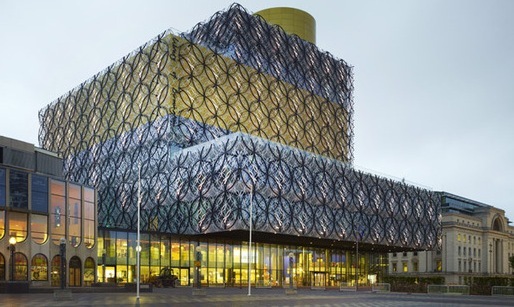 Birmingham City Council has confirmed massive cuts at the recently opened Library of Birmingham, with opening hours at the library set to be slashed from 73 to 40 hours a week from April. Up to 100 jobs are expected to be lost. At the same time, it has responded to pressure and secured funding of £200,000 to protect ten jobs in the library’s Photography Collections department. When the new £189m library opened in 2013 it was lauded as a flagship cultural project for the city, but central government budget cuts almost immediately put its services under threat. In December 2014, the city council put forward a proposal to make £72m of cuts across the city, with major savings at the library including cutting the entire specialist photography archive staff. In response to the proposals, the photographer Paul Hill launched a petition calling on Birmingham City Council to protect the library’s photography collection, which is recognised as ‘of national and international importance’ and documents the history of both amateur and professional photography in the UK. Hill stated: “When I and other depositors, who include such renowned British photographic figures as Daniel Meadows, Martin Parr, John Blakemore, Brian Griffin, Vanley Burke, John Myers, Anna Fox, Nick Hedges, and Val Williams, agreed to the library acquiring our archives or collections we were assured that they would be accessible to the public as well as specialist researchers. In January, a letter in The Times from the Royal Photographic Society with over 100 signatories called for the government to step in to protect the collection. The council is also in talks with other institutions, including the British Library, to help secure the future of the Library of Birmingham. While the future remains bleak for many staff at the library and a raft of important services look set to go, it seems that for the moment at least the Photography Collections’ team is to stay.